Malta has recently gained a reputation as the ‘Blockchain Island’, as the major cryptocurrency exchanges are inbound for relocation. 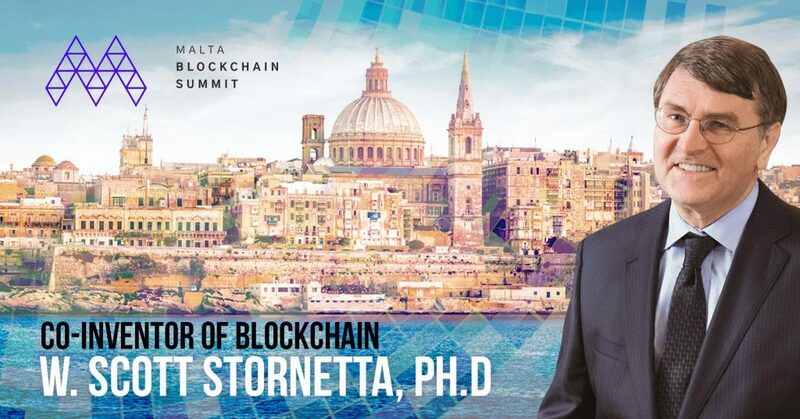 The Malta Blockchain Summit has now raised the bar by inviting one of the ‘Founding Fathers’ of blockchain, W. Scott Stornetta Ph.D., to the November show, expected to become one of the largest blockchain and DLT events in Europe in 2018. It is common knowledge that Bitcoin was invented by an as yet anonymous person or group of people called Satoshi Nakomoto. However, experts in the field are aware that Dr Scott Stornetta and Dr Stuart Haber first conceptualised blockchain in 1991, publishing a series of peer-reviewed journal articles and filing a number of patents through the 1990s. Bitcoin was eventually built upon these foundations with Dr Stornetta and Haber referenced three times in Satoshi’s original Bitcoin whitepaper. Dr Stornetta has remained in the background during most of the cryptocurrency hype, but has now stepped forward and assumed a prominent role as Chief Scientist for the Australian investment firm First Digital Capital, where he will be in charge of evaluating blockchain technology firms and ICOs. In November, he will be speaking to blockchain enthusiasts at the Malta Blockchain Summit. “I was already somewhat aware of the strategy which the government of Malta had adopted to make itself a centre of blockchain activity, and some of the success they have seen in attracting businesses. Recent events have significantly increased my appreciation for how effective the government of Malta has been in taking a lead role to build an industry centre,” says Dr Stornetta. Malta has recently earned the name ‘Blockchain Island’ as the two largest crypto exchanges, Binance and OKEx, are both relocating to the island. The epic proportions of the Malta Blockchain Summit, set to take place at the InterContinental on November 1-2, are a reflection of this momentum. The summit includes four conferences, a buzzing expo floor, a two-day Hackathon, a Blockchain Awards ceremony, an ICO Pitch and ends with a suave Crypto Cruise. Dr Stornetta is one of the most keenly anticipated speakers. “I am happy to provide useful ways to support Malta in its efforts to strengthen its already leading position in establishing itself as a centre of blockchain-related activity. Hence, my focus is on delivering a keynote that will be unique, entertaining and valuable for its insight to all attendees at this summit,” he said. Boasting over 4000 delegates, 100 speakers and 150 sponsors and exhibitors, the Malta Blockchain Summit promises to be an innovative and momentous opportunity for global influencers to network, forge new connections and debate the potential applications of blockchain across myriad industries such as health, entertainment, government, and banking. The Prime Minister of Malta, Joseph Muscat, will inaugurate the regulatory conference. With Dr Stornetta joining the summit, it becomes increasingly clear that the Malta Blockchain Summit is at the centre of gravity for emerging blockchain and DLT.